October 2010 Leaders of Learners – Eric Jensen article published. Texas ASCD. The brain is involved in everything we do and it takes many approaches to understand it better. Brain-based education has withstood the test of time and an accumulating body of empirical and experiental evidence confirms the validity of the new paradigm. Many educationally significant, even profound, brain-based discoveries have occurred in recent years such as neurogenesis, the production of new neurons in the human brain. It is highly likely that these discoveries would have been ignored if the education profession hadn’t been primed, alerted, and actively monitoring cognitive neuroscience research and contemplating its implications and applications. Let’s start this discussion with a simple, but essential, premise: the brain is intimately involved in and connected with everything educators and students do at school. Any disconnect is a recipe for frustration and potentially disaster. 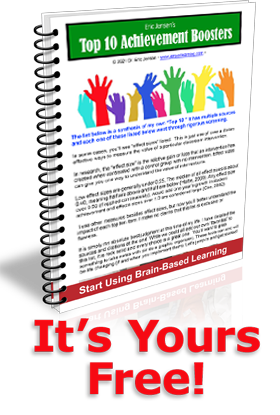 Brain-based education is best understood in three words: engagement, strategies, and principles. Here you will learn the principles of how the synergy of biology, cognitive science, and education can support better education with direct application to schools. Here are some of the powerful connections for educators to make in our new understanding of the new brain-based paradigm. 1. Highly relevant is the recent discovery that the human brain can and does grow new neurons. Many survive and become functional. Now we now know that new neurons are highly correlated with memory, mood, and learning. Of interest to educators is that this process can be regulated by our everyday behaviors, which include exercise, lowering stress, and nutrition. Schools can and should influence these variables. This discovery came straight from neuroscientists Gerd Kempermann and Fred Gage. Practical school application: support more – not less – physical activity, recess, and classroom movement. Read the rest of the article here..
Ouch! Does Pain Change The Brain?